What we have here is a USB to serial RS232 adapter designed around an American made CY7C64225 chipset from Cypress Semiconductors. The Cypress chipset has a reliable and solid architecture with all basic features, however it does not have some of the more advanced port features seen in some of our other adapters. 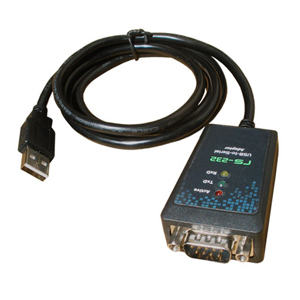 For the reason described above this USB serial adapter is ideal for most general applications requireing a simple and reliable adapter without any advanced features. It will work with Windows XP, Vista, 7 and 8, including Win CE, Mac, Linux and Android. This adapter is not recommended for complex applications requiring manual parameter adjustments or custom programming. The adapter is powered from your computer's USB port so no additional external power source is needed. 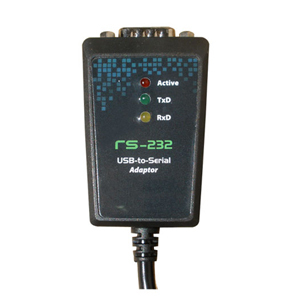 The RS232 end is a standard 9-pin D-sub connector for easy connection of all standard serial cables. After installing the included drivers and connecting the Serial to USB adapter to your computer, it will show up as a virtual serial COM port in Windows Device Manager where you can manage and configure it as if it was a standard built-in serial COM port.